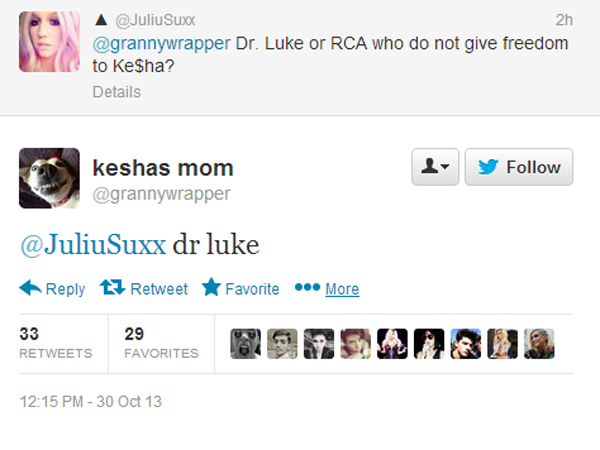 The rift between Ke$ha and Dr. Luke runs deeper than first thought if tweets from the pop diva’s mother are any indication. Last night (October 29) Pebe Sebert — a talented singer/songwriter in her own right — jumped on Twitter to demand creative freedom for her daughter and fired shots at the super-producer. This is getting really messy. Ke$ha addressed the situation in a recent Rolling Stone interview, saying she wanted more creative freedom but was rather vague about the details. Still, it’s becoming increasingly clear that she’s not happy and desperately wants to part ways with her mentor. See Pebe’s frustrated tweets after the jump. I Love you animals! Thank you for protecting my baby girl! She loves all of you! She is one of you! Help street dogs! Should Ke$ha make a statement clarifying the situation? Have your say in the comments below.